A winery is one of the most complex businesses to own and operate. Harvesting, blending, and then selling are just the beginning steps in making your business run smoothly. 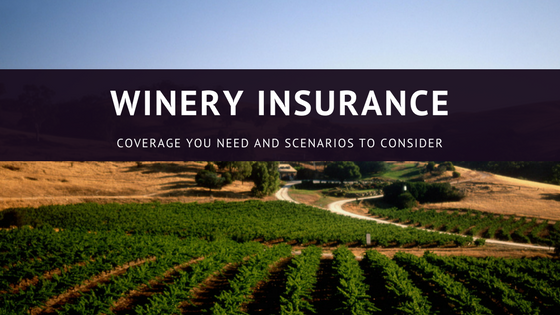 The number of people it takes to run a winery coupled with the potential risks can make for a very complicated insurance situation. The above are just a few of the possible problems that could arise from owning your winery. Because of all these challenges, you will need several types of insurance to fill in coverage gaps. Liability – General liability provides coverage for bodily injury and property damage claims, such as when a guest slips and falls or the wine was contaminated causing someone to get sick. This coverage will even protect you from libel claims, slander, advertising liability, and product liability. Property – If you own your building you will want protection for that, as well as the items inside. Equipment, contents and any inventory are covered here. Unless you are prepared to continue paying regular operating expenses should there be a covered property loss and you have to close for a period of time, you will need to add business interruption coverage. Equipment breakdown is another vital protection that is often found under the property insurance policy, and if not, it can be added. Crop – Because you need grapes to keep your business going, you want to protect them as well. Crop insurance typically covers weather issues, plant diseases, insect issues, and some property perils such as flood and fire. In addition to the above essential coverages some other potential options to consider include coverage for wine in storage or transit, contract cancellation coverage, tank collapse or leakage, mobile equipment coverage, and liquor liability. Wineries are sophisticated and you may not have the time to research all of the available coverages. Reach out to us today, so we can advise you on how to protect yourself and your business best. Our office is located in Hanover, PA, but we can meet you at your location too. Call us at 717-632-6001 or fill out the insurance request form below.